As EU leaders prepare to meet Wednesday (23 September) for an extraordinary summit, one question will haunt them: How to distinquish economic migrants from asylum seekers. EURACTIV Czech Republic reports. Hungarian Prime Minister Viktor Orbán believes that the “overwhelming majority” of Syrians, Iraqis and Afghans coming to the EU are not refugees but economic migrants hoping for a better life in Europe. His Slovak counterpart, Robert Fico, holds similar views. The Czech premier, for his part, prefers adding some nuance. “We have to distinguish those people who are really fleeing the war and seeking protection in Europe, and people who are just joining this flow as a part of a standard economic migration we have been witnessing in various forms during the last 25 years,” Bohuslav Sobotka told lawmakers last week. Europe is currently seeing a mixed influx of immigration, in which economic migrants mingle with asylum seekers. Economic migrants are a harder sell for some of Europe’s political leaders, even though, according to the UN, they represent only a small fraction of the refugees arriving in the EU. According to the UNHCR’s Andrej Mahecic, there is no official figure for how many economic migrants form part of the refugee flow. But he pointed to UN statistics showing at least three quarters come from conflict-ridden countries like Syria (51%), Afghanistan (14%), Eritrea (8%), and to a lesser extent, Nigeria (4%), complicating the picture. So when does an economic migrant become an asylum seeker? “In the past, the migration may have been motivated by economic reasons,” Mahecic admitted. “But there has been a clear shift in the past year, with a strong refugee narrative,” he told EURACTIV, calling for special asylum procedures to be applied for those fleeing war and persecution. Tomáš Zdechovský, a Czech centre-right MEP (European People’s Party), visited migrant reception centres during a recent trip to Sicily with a European Parliament delegation. He said that distinguishing between the two categories of migrants is not always an easy task. Zdechovský visited the Pozzallo and Mineo centres in Sicily. He said most of the migrants there were Africans who arrived to Europe by boat. “I think not every migrant needs our help,” he told EURACTIV. His colleague Jean Arthuis, a French MEP from the ALDE group, approves. “We have to speed up the legal procedures for those who have the right to be granted international protection, but also swiftly apply age-determination procedures in case of serious doubt about allegedly unaccompanied minors, and repatriate economic migrants to safe countries,” said Arthuis, who co-chaired the Parliament delegation. The UNHCR agrees that economic migrants should be distinguished from refugees and asylum seekers. But it stresses that return procedures for those being denied asylum should be pursued “in safety and dignity”. The European Commission outlined a comprehensive package of proposals to address the refugee crisis, including measures to tackle the root causes making people seek refuge in Europe. Besides the relocation of 120,000 people from most affected member states, the Commission proposed a common European list of safe countries of origin to facilitate returns. To make the policy more effective, it also proposed a €1.8 billion trust fund to tackle the root causes of migration in Africa. The humanitarian organisations dealing with the crisis have no doubt that economic migrants have joined the flow of refugees seeking refuge in Europe. But at the same time, they called on Europe to show some compassion for them. “I would point to the difficulty of their journey. It is not an easy one,” said Iverna McGowan, acting director at the Amnesty International European Institutions Office. “We can see pregnant women and many migrants losing their lives. Even though they are economic migrants and they are seeking for better living conditions, many of them are fleeing despair, poverty and sometimes violence,” she said. As EU leaders gather in Brussels to find a solution to to the crisis, the humanitarian organisations have come up with their own proposals. “We have to address the root causes of involuntary migration, such as inequality and social injustice, poverty unemployment, lack of development, climate and natural disasters, war and humanitarian crises,” said Shannon Pfohman, the Head of Advocacy for Caritas Europa. She also calls on countries to increase official development assistance from the current 0.42 % of the GNI (€58.2 billion) up to the promised 0.7% of the GNI, with a focus on fragile and least developed states. As EU leaders meet this week, another issue they face is the disinformation relayed by traffickers who convince people of travelling to Europe. Driven by the prospect of huge profits, smugglers have sent a record 150,000 refugees on boats to Italy so far this year. 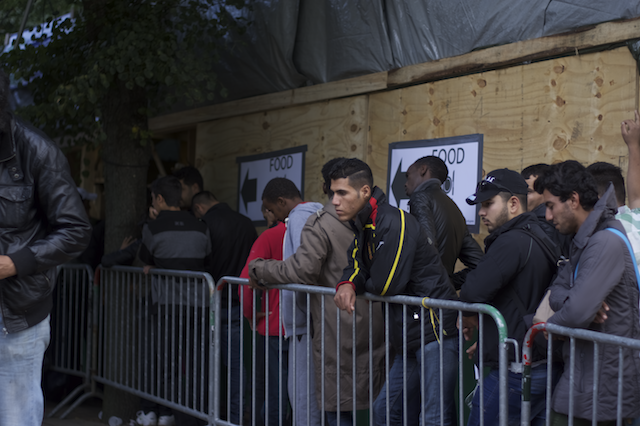 “I was horrified at how naïve some migrants I met during the summer control mission were. They believe they can earn enough money in a year to buy a Ferrari or to be able to play professional football in Chelsea. We should tell them it is not possible even before their journey,” Zdechovský said. European authorities say it is their top priority to fight an army of an estimated 30,000 people-smuggling suspects. “It is mainly about early and rapid information exchange. If the member states have the information leading towards revealing the crime, they should share and compare it with our databases,” Europol Deputy Director Old?ich Martin? told EURACTIV.cz in an exclusive interview. “Economic migration, especially coming from Sub-Saharan Africa, is rarely spontaneous,” adds Ond?ej Horký-Hluchá?n an analyst at the Institute of International Relations in Prague. EU leaders have agreed on the outlines of a two-year plan to deal with unprecedented numbers of migrants fleeing the Middle East and Africa. But implementing the system to resettle or relocate 160,000 refugees is proving to be highly contentious at a time of rising anti-immigration parties in Europe. Many countries, including France and Germany, do not reject the idea of burden-sharing for refugees, but contend that the European Commission's proposed quota system needs to be reworked. EU leaders argued through the night at a summit in June over the plan, wary of taking in migrants and reflecting deep national rivalries that the bloc's cooperation is supposed to transcend. They have set December as the latest deadline to agree final numbers. But the refugee crisis has worsened since then. European Commission President Jean-Claude Juncker now hopes to convince EU member states to accept the mandatory distribution of 160,000 refugees. In order to achieve this, the Dublin Regulation, which forces refugees to apply for asylum in the first EU country they arrive in, and is often accused of destroying solidarity between EU countries, would have to be altered or suspended. The urgency of the migration crisis will force the EU to review the list of safe countries of origin and examine the system of distribution for asylum seekers, two issues that have been blocked at the European level for years. Lots of timely response as usual the EU is to have a meeting on the 23rd of October?! When will the taxpaying EU citizens remove the self interested Commission and Politicians who are currently sat on their hands? Germany wants the migrants, Germany can have ‘all’ the migrants. The real refugees are in Camps in the surrounding areas. They don’t have the $10,000 or so to pay people smugglers to make the trip into Europe. At the heart of this crisis is the inability to place and receive trust between states, state and citizen, and people and communities, built up over many years. It is calling into question the values and aspirations of the European project. The current migrant crisis brings all of this into sharp relief: The opinions of citizens are polarised, the competence and ability of governments to meet and to balance urgent and ongoing needs is under question, and the EU’s policies and capacity to act are being tested. This will be the focus of the 2015 EuroPhilantopics on 10 November, in Brussels.